We really wanted to take the Biological Soil Crusts Class at the Desert Institute last year, but we weren't able to do so until this year. Biological soil crusts are awesome, as the teachers reminded us throughout the two-day course. The top layer of many soils are alive with micro-organisms: bacteria (cyanobacteria), lichens, mosses, diatomes, tardigrades and more. These bind together into a community that forms a crust on soils fixing carbon and nitrogen, slowing or preventing erosion, creating a habitat for plant life, and more. See soilcrust.org for more information. Nicole Pietrasiak (bacteria), Kerry Knudsen (lichens) and Theresa Clark (mosses) taught the class. Their enthusiasm for the subject matter was infectious. The class went to Joshua Tree National Park for a field work component. Ken took this photo in the park. 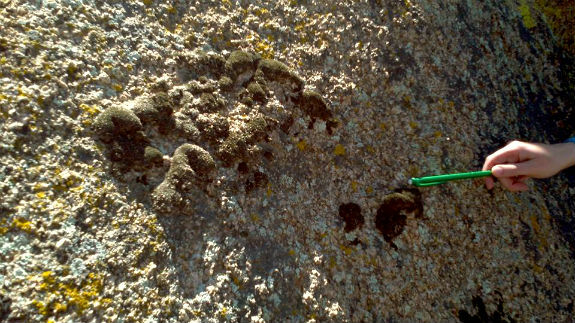 Kerry Knudsen showed us "before" and "five years later" photos of a patch of lichen to illustrate how slowly they grow. I thought the concept of time was interesting in relation to lichens. Yes, they grow slowly in human terms, but really, there is no fast or slow in lichen terms. If we, as humans, can reconceptualize time outside of our own human limits it might affect the way we treat the planet and other living creatures for whom time has no meaning. The desert seems to wreak havoc with the human concept of time - the extremes of heat and aridity speed up oxidation, and are certainly no friend to humans trying to slow the march of time, or who still cling to the hope of a dewy complexion. Being so close to nature in the desert shifts time, as well, and if you are so inclined, you might begin to see yourself as part of a huge spiral of time, rather than as a blip on a timeline. 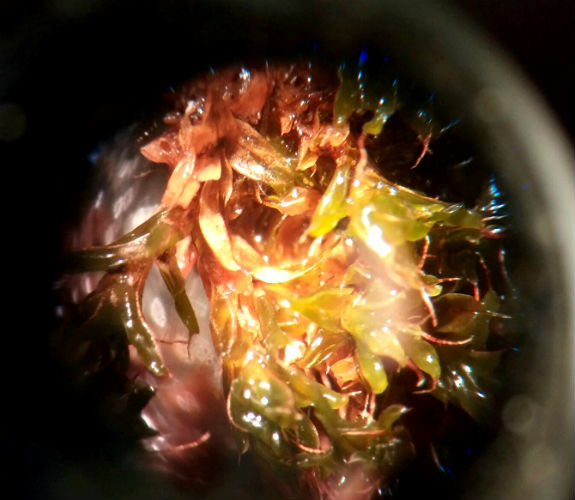 We also worked with microscopes and tweezers and slide mounts and were able to see single cells in bacteria and mosses. That was a first for me and very exciting. The moss below is syntrichia norvegica, common in the park. We learned about dessication tolerance, or the level of drying and dormancy an organism can experience before it dies. Now I have a phrase to apply to what I experienced personally last summer. During the break we took a walk around the grounds of the visitors center and found this, which is now cordoned off. 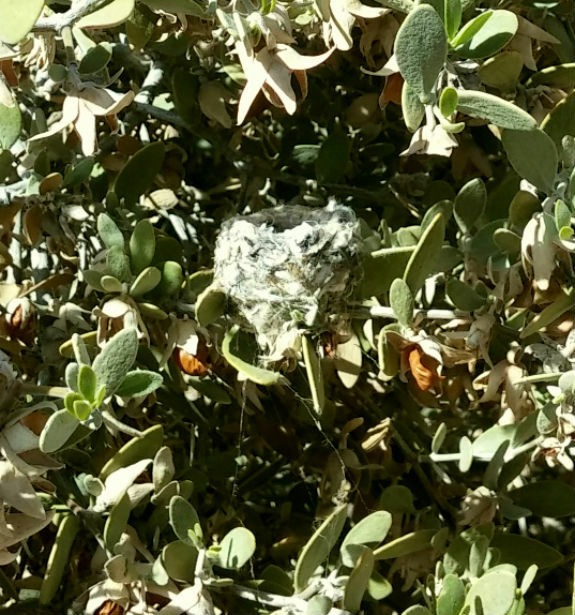 The nest of a hummingbird is secured in a jojoba bush. There are two tiny eggs inside. Next week we're taking the Desert Institute's Native Plant Uses with Daniel McCarthy. I expect that class to be as fascinating as this one was.